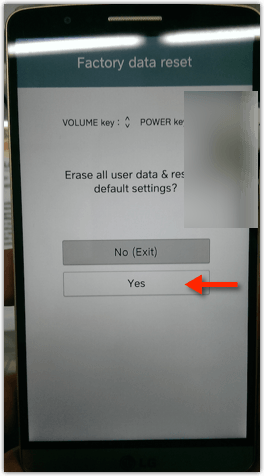 How to make a Factory Data Reset (Hard Reset) on LG G3 smartphone? There are THREE different options to make a hard reset via buttons. Only one is for your phone. You have to try out all to find out which is yours, because it depends on your exact Android version. Release both buttons when the Factory data reset screen displays. From the Factory data reset screen, select Yes. Use volume keys to navigate. When the LG logo is displayed release the Power button only then immediately press and hold the Power button again. When the LG logo is displayed release BOTH Buttons then immediately press and hold the Volume Down and Volume Up buttons. From the Factory data reset screen, select Yes.